Very close to the centre – a few minutes walk – in a peaceful square close to the waterfront, just inside the ancient city walls. The house dates from the beginning of the Tudor period in the late 15th century, but the site was first used in the reign of King John 300 years earlier. The standard information is freely available, so I’ll just give my impression of the place – plus slideshow of my photos at flickr. Big house, full of dark, creaking floorboards. All the technology of historical re-enactment: a spooky ten minute audio presentation in the main hall, spin-and-point computer displays, touch-screen information on a curious piece of wall plaster teeming with faint Tudor graffiti, and a tidy knot garden with a couple of crude heraldic beasts (not a patch on the Hampton Court beasts). The staff are helpful, and you can spend your cash in the gift shop and a very modern cafe. A great effort, but I found it a bit limited. Recreation and preservation are no substitute for imagination, and bare ruins are more interesting to me than this kind of project. In my view the best parts of the site are outside. At the end of the garden is a great cubic hole – 50 feet square, 50 feet deep – the ruined interior of a medieval palace, which was incorporated into the city’s defensive walls. 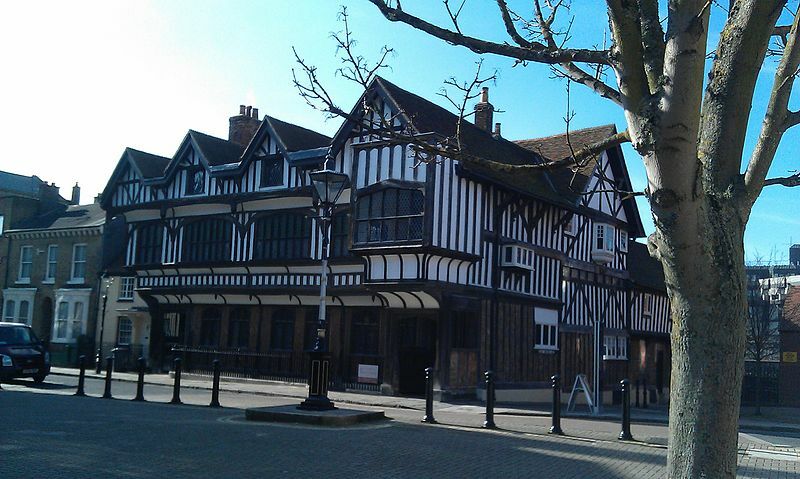 A more impressive building than the lofty Tudor house, yet discarded in the city’s development from medieval to modern. And perched on one side is a great brass canon from the reign of Henry VIII, cheekily aimed at the high rise commercial buildings across the water. On the left, an image from the 19th century. On the right, Blue Anchor Lane today. Click for larger versions. The images show what has been lost. Southampton was destroyed long ago: the inner city hammered by the Luftwaffe in WWII, and what remained subjected to brutal town planning. Remarkably, the Tudor House survived, but with few people, modest commerce, little life. Southampton City Council adminsters the site, well worth a visit. ps. They provide you with a hand-held audio unit for the tour – do NOT walk out with the unit in your back pocket … cough cough!